3 Bedroom Detached Bungalow For Sale in Frinton-on-Sea for Offers Over £340,000. FEATURED IN THE BIG OPEN HOUSE EVENT 27th & 28th APRIL- OPEN TO OFFERS THIS WEEKEND ONLY- CALL NOW TO ARRANGE YOUR VIEWNG ON 01255 677 881. 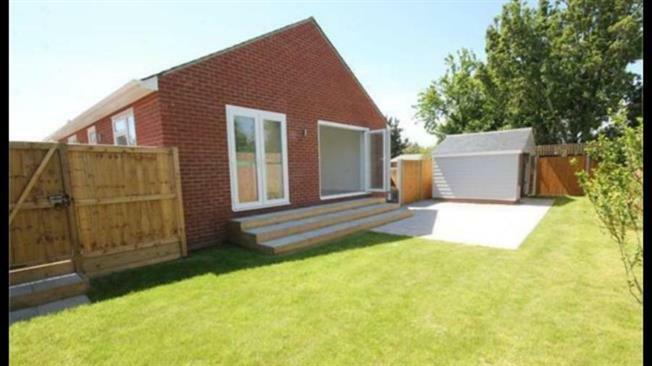 Bairstow Eves are pleased to present this new build, three bed bungalow, located close to Frinton town centre and all local amenities, including the prestigious Greensward and mainline railway service. The property has been finished to a high standard throughout, featuring a modern kitchen/dining room with fully integrated appliances, quartz worktops and high gloss, soft close units, a master bedroom with a walk-in wardrobe/dressing room, two further bedrooms, and a fully tiled bathroom and en suite. The property also benefits from gas-fired under floor heating throughout, controlled by individual thermostats in each room, a large Summer House in the rear garden, and a remote-control vehicle turntable, with drive-on, turn, drive-off functionality, situated on the long driveway. Call now to book your viewing. Double glazed window to front with French doors leading to garden and patio. High gloss, soft close, Dove grey kitchen units with Quartz work surfaces arranged in an L configuration, stainless steel one and a half bowl sink with integrated appliances to include fridge/freezer, washing machine, dishwasher with oven and microwave built into housing unit. Under floor heating, spotlights and opening to lounge. Fully tiled walls and floor, walk-in glass shower cubicle with body and overhead showers. Wash basin inset into contemporary vanity unit, low level W.C, oval mirror with cabinet, under floor heating and spotlights. Double glazed window to rear, fully tiled walls and floor, panel bath with shower and screen, wash basin inset into contemporary suspended vanity unit, low level WC, oval mirror with cabinet, under floor heating, spotlights. Front 70' driveway lined with trees and mature shrubs with lighting, leading to remote controlled electric vehicle turning circle. Rear Steps leading to garden mostly laid to lawn, with concrete paved patio area with a shingle inset.